Planning for and monitoring costs and the profitability of routes has become as critical for success as yield management, network planning and airline branding. Today, cost management represents a strategic success factor for any airline. Nevertheless, many of the financial managers who work for the aviation industry concentrate too much on standard cost accounting and rely too heavily on rough financial controlling based solely on spreadsheets. They do without precise targets or actual comparisons and so achieve insufficient transparency. But the airline business is a dynamic one. The market, the competition and cost structures are constantly changing, often completely unexpectedly. In many cases decisions need to be made extremely quickly and before your finance department has been able to determine exactly what the monetary consequences will be. How can the success of an individual route be calculated? What destinations and starting points will be profitable? What chances and risks do alternatives offer with respect to the fleet or route network? And what influence does purchasing, flight planning or invoice validation have on the profitability of a network? Airlines generally have all of information they need. However, it is stored in multiple, isolated systems that are incapable of integrating with each other. 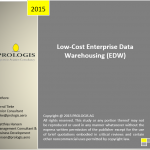 Data Warehouses as well as Information and Planning Systems represent yet another major focus for PROLOGIS.